Taxi continues to be amazing. It’s hard to believe she’s only been with us for 11 months. She is so smart and so sweet. 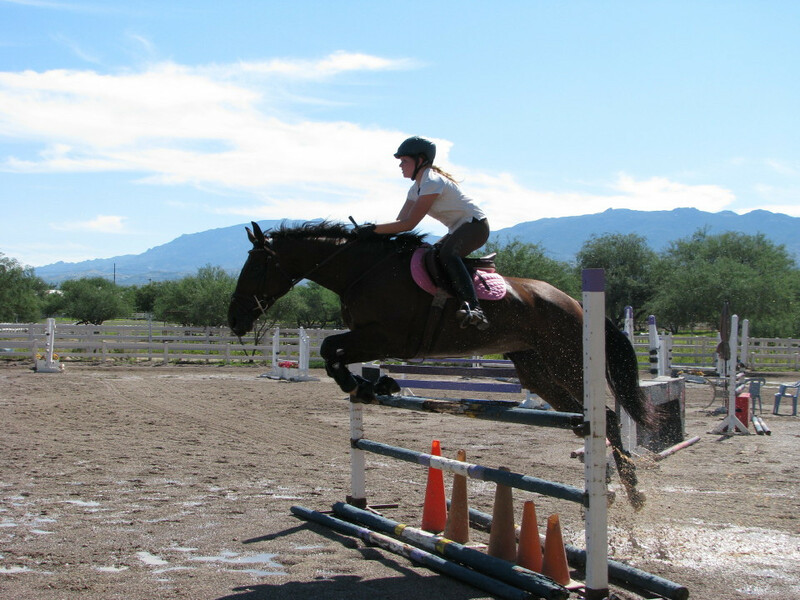 She totally trusts Cait which translates into her doing amazing things, like jumping at a new barn in deep puddles (after a monsoon) without questioning the jumps or the water. They are competing at their first HT next weekend. I’ll let you know how it goes. Cait told me that all three Pony Clubbers in Arizona, who bought horses from you, will be competing at this Horse Trial. She thought it would be neat if they had saddle pads (at least for schooling) that had bitsandbytesfarm.com embroidered on the corner to show they are “your” babies. I know that isn’t possible for this show but thought the over-all idea was worth sharing. I’m attaching a picture from their lesson this morning and a link to a video of Taxi jumping. Enjoy! Posted in B&B Success Stories, Tax Hike aka "Taxi"